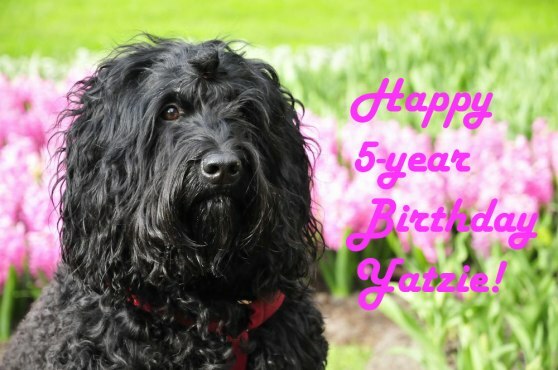 Yatzie, my love, turns 5 today! Looking back at the years passed we have experienced so much together. After the wild puppy years and the bubbeling youth Yatzie is now a mature "lady". She is also an experienced traveller and mother. She has moved to a new country and extended both her human and her dog family. She has learned many skills and proved herself a working dog in the hunting training. She has done excellent in the exhibition rings but most of all - she loves her family and we love her! Yatzie has a soft and loving spirit that melts your heart. She is so close to us, and she is always eager to show us her love with her kisses and her cuddeling. Many, not only her family, say that Yatzie is not just a dog, she is like a human. She talks to us with her beautiful, brown eyes but also with different sounds that she makes and with her clear body language. Today we celebrate Yatzie's fifth birthday and the privilege of having her as part of our family and we will spoil her even more than we do every other day. Happy birthday beloved Yatzie! Xronia polla! Gefeliciteerd! Grattis!